How robust is your plumbing system? If you have metal plumbing pipes, including copper, galvanized steel, cast iron and brass, you will experience corrosion at some point during the lifespan of the pipe. The length of time before you experience corrosion depends on many different factors, including the type of material, the acidity of your water and the chemicals in your potable water. To understand how corrosion occurs, it’s best to start with the composition and properties of water. Water is scientifically designated as H2O, which stands for one oxygen atom and two hydrogen atoms. It is considered to be odorless, colorless and tasteless, and it is neutral with a pH of 7 in its purest form. Water is also the ultimate solvent. If given enough time, water will dissolve anything, including rock, and once dissolved, the substance becomes part of the water solution. As the water picks up dissolved solids and liquids, the pH of that water changes. Acidic water is considered to be any water that has a pH of 6.5 or less. Rainwater tends to have a pH around 5. Acidic water dissolves more solids, and it can hold more solids, which aides the corrosion process. When the pH of water is high or more base, deposits are left on items, including plumbing pipes and water fixtures. Extremely base water also requires more chlorine in order to make it safe for drinking. In general, corrosion occurs when water comes in contact with metal surfaces, like metal plumbing pipes. Some metals, like copper, are more resistant to corrosion than others, but all types of metal can corrode. For houses build before 1986 that contain galvanized steel and lead soldering, the dangers of corrosion could be even higher, because the water can pick up lead and hard metals, which are hazardous to human health. Rust is most often associated with iron or steel. It occurs when oxygen interacts with the metal in the presence of water, which can be in liquid form or in the air. 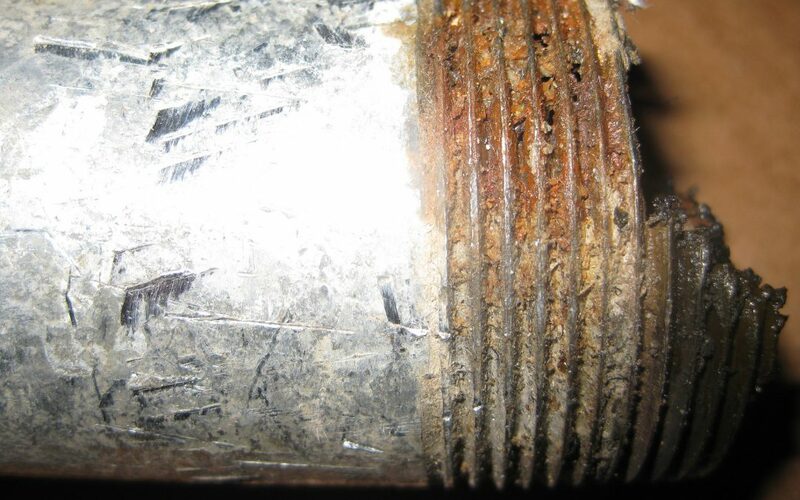 This form of iron corrosion can slowly destroy the pipe by leading to holes and an eventual pipe collapse. Copper is mainly susceptible to sulfate and chloride corrosion and tends to occur in copper pipes that are buried. In this scenario, the soil contains abnormally high levels of sulfate and chloride and is continually moist or wet. This combination of factors can lead to copper corrosion and the deterioration of the pipe. All types of pipes are susceptible to acidic water. This water slowly dissolves everything it contacts, leaching hard metals and chemicals from the pipes, including lead and copper. One well-known example of acidic water corrosion is Flint, Michigan. When the city switched to a water source with lower pH values, the municipal plumbing pipes quickly corroded, leading to lead and hard metal water contamination. If you have metal pipes in your large residential building or commercial building a pipe inspection can determine whether those pipes are experiencing corrosion and rust or not. You can also look around your building at the visible pipes and water fixtures, like faucets and check for stains or a white substance, which can indicate problems with your water supply and/or plumbing pipes. If you are having rust or corrosion problems, an epoxy liner may be the solution. Pipe liners are inserted into existing plumbing pipes and left to cure. Once the liner has hardened, it prevents water from coming into contact with the metal of the host pipe, which can eliminate future corrosion and extend the useful life of your plumbing pipes. 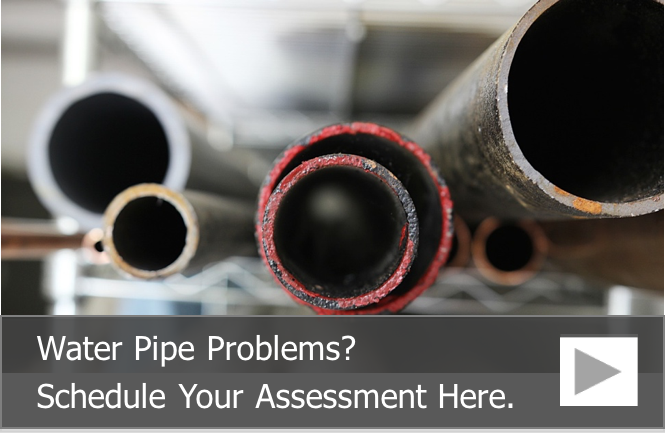 To learn more about how pipe liners can help restore your plumbing system, call us at 815-790-9000.